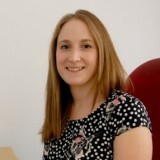 A departing editor has hit out at “bean counters” in her final column for the newspaper as it prepares to switch publication dates from Sunday to midweek. Sarah Cox, left, has claimed a “strong voice” has been “silenced” following Trinity Mirror’s decision to replace Bedfordshire on Sunday with a new title, provisionally known as ‘Bedfordshire Midweek’, early next month. Sarah had handed in her notice before the changes, which have put an unspecified number of jobs at risk, were announced last month. Her farewell column was published in Sunday’s edition, one week before the last BoS goes to print. 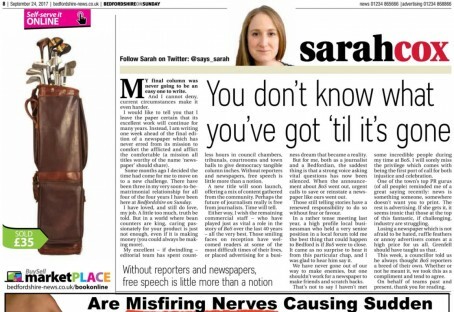 Certain extracts were removed, but Sarah has now published a screenshot of the full version of the column on her personal Twitter page. “Some months ago I decided the time had come for me to move on to a new challenge. There have been three in my very-soon-to-be-matrimonial relationship for all four of the four years I have been here at Bedfordshire on Sunday. Sarah continued: “For me, both as a journalist and a Bedfordian, the saddest thing is that strong voice asking vital questions has now been silenced. “Losing a newspaper which is not afraid to be hated, ruffle feathers or annoy advertisers comes at a high price for us all. Grenfell should have taught us that. Three weekly titles in Cambridgeshire and Suffolk – the Ely News, Haverhill News and Newmarket News – are also set to close this week as part of the same changes. Sorry, and so say most of us. Trinity Mirror and the other groups, greed, a desire to cut costs to keep shareholders happy and pay back the loans rather than invest in quality journalism. This is responsible for the parlous state of modern British journalism. She’s spot-on. The Beds on Sunday was a really good newspaper. This is such a shame. And it tells us all we need to know about Trinity Mirror – and the other Orwellian tyrannies destroying British journalism for no other reason than corporate avarice – that Sarah could only find an audience for these brave and true words after she’d picked up her cards. I loved this paper with a passion even if it did mean I never had a day off due to all the other titles I handled and this one coming off on a Saturday evening before we distributed it overnight in to Sunday 0800. It works and is still loved by the community. Before they started charging for it at the BOS office they were able to even give out 100’s of them on a Monday because people wanted them and would be waiting as the office opened even though it was way off the High street. The Bedford Midweek they trialled fell on it’s face as will this new incarnation because the idiots don’t have a clue. They sit there and talk the same old theory of people making weekend decisions on a Thursday as being proof of a successful strategy when the truth is that we live in a world now where we think about the weekend on the weekend. We are out at work at 0700, not back in till gone 1800 and don’t engage are brains past a meal and a bit of time on the sofa during the week. The BOS worked as it hit doorsteps for free as people woke up on the one day they actually had a chance to look at it. It had eyes on it and is why people loved it. Out of the 60+ titles I have handled I would say that less than 20% still exists and for some reason this one staggers, surprises and upsets me the most. At least we get to hear a departing editor giving it both barrels, and telling it like it is. Many are forced out and bound by constraints that don’t allow them to tell their side of the story. For once a superb and honest farewell piece from an editor. The industry simply cannot afford to lose people with such passion for good journalism. Sarah will do well in whatever her next move is. She obviously cares about what she does. A lot of managers in the newspaper industry simply do not. Shutting BoS is a crime against all those who worked for it and made it the iconic publication it was. Can’t believe it wasn’t still making a decent profit. The only winners in this are those dodgy geezers in town who know they can now sleep easily at night without fearing their activities may be exposed in BoS. RIP to a great newspaper, put away by a company who clearly just didn’t get it, or have abandoned real journalism. From watching what TM are doing all over the country it is clear that they are paying no attention whatsoever to the actual papers they are destroying, or the staff. The bean counters have some fixed ideas in their heads – some business model dreamt up on a spreadsheet – that is uniform & pays no attention to local needs. And the staff, good or not, aren’t people, they are as much units of cost as office chairs. From what other commenters have said on here, it seems that BoS was almost as good as it was under Branston, as different and possibly even as successful – but it didn’t fit head office’s formula, so it had to go. Idiots.